Keratin Shampoo goes beyond cleansing to restore smoothness, straightens, and deeply hydrates hair by sealing split ends with an exclusive blend of Phyto-Keratin Protein, Brazilian Buriti Oil, Macadamia Nut Oil and Wild Flower Honey. 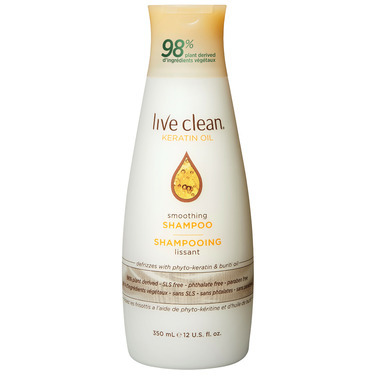 Shampoo gently cleanses for softer, shinier, frizz-free hair. Hair strands are rejuvenated with smooth lustre and silky movement and shine. Keratin strengthens and smoothes hair for healthier hair with every wash. Excellent shampoo, you only need a little bit(I tend to squirt too much out). Leaves hair clean and not frizzy. Best shampoo ever. I have no reaction, itchiness at all, plus it is very moisturizing. Outstanding product and no heavy perfumey scent. The Keratin Shampoo and Conditioner have been my go-to duo for close to a year. Love the natural ingredients, gentle on my hair. Always leaves hair soft, smooth with nice body. I have medium thick hair. This keratin shampoo makes my hair feeling soft and gives a healthy, fuller look. Love using both, with the conditioner. They smell great too. Will try the oil too next time. This Keratin oil shampoo and conditioner make my hair extremely soft. While blow-dried my hair are very shinny and slky. Love the smell. I recommend it, especially during summer time. Shampoo & Conditioner make my hair so soft and the coconut smell is very nice. It doesn't straighten my hair or treat my frizziness well and it should be less expensive. After reading all the horror stories about keratin treatments I was very worried. I used a small portion the first time just to make sure, and it works pleasantly well~ I don't even need hair conditioner to use with this shampoo. Really recommend it!